But if some of the branches were broken off, and you, although a wild olive shoot, were grafted in among the others and now share in the nourishing root of the olive tree, do not be arrogant toward the branches. If you are, remember it is not you who support the root, but the root that supports you. Then you will say, "Branches were broken off so that I might be grafted in." That is true. They were broken off because of their unbelief, but you stand fast through faith. So do not become proud, but stand in awe. For if God did not spare the natural branches, neither will he spare you. Note then the kindness and the severity of God: severity toward those who have fallen, but God's kindness to you, provided you continue in his kindness. Otherwise you too will be cut off. And even they, if they do not continue in their unbelief, will be grafted in, for God has the power to graft them in again. For if you were cut from what is by nature a wild olive tree, and grafted, contrary to nature, into a cultivated olive tree, how much more will these, the natural branches, be grafted back into their own olive tree. Alongside these three warnings not to be proud God gives us reasons why being a Christian rules out pride and boasting over other people. The reason we focused on last time was that we stand only by faith. And there is something about the origin of faith—it's the gift of God—and the nature of faith that rule out boasting in ourselves and shift all boasting over onto God for his grace. How Do We Maintain Faith and Endure to the End? I promised last time that after dealing with the origin of faith and the nature of faith we would this time deal with the way we maintain faith. I don't choose to deal with this merely because it is personally urgent for me—which it is, since no question is more pressing than how to persevere in faith to the end. Jesus said in Mark 13:13, “ The one who endures to the end will be saved.” That would be reason enough to deal with this question of how you maintain the faith and endure to the end. But the reason for dealing with it here is that it is so forcefully pressed on us by the flow of Paul's thought right here in this text. Follow with me how he is thinking from verse 20 through verse 22. Pick it up with me in the middle of verse 20: “You stand fast through faith.” In other words, your life, your salvation, your remaining in this tree of covenant and promise and hope, depends on your persevering faith. Then he says, “So do not become proud, but stand in awe [literally, “fear”].” In other words, there is a very important role for fear in the Christians life in relation to maintaining faith to the end. You stand fast through faith. So don't be proud, but fear. Then he continues in verse 21: “For if God did not spare the natural branches, neither will he spare you.” In other words, there is reason to fear. If you give way to unbelief and stop trusting Christ for your life and hope, then you will be cut off. So fear every rise of unbelief in your heart. Or as Paul says in Philippians 2:12, “W ork out your own salvation with fear and trembling.” When unbelief starts to get the upper hand fear and tremble and fly to Christ. Then he continues in verse 22 and gives us a strategy for maintaining faith with a proper use of fear: “Note then the kindness and the severity of God: severity toward those who have fallen, but God's kindness to you, provided you continue in his kindness.” In other words, Paul says that since ongoing faith is utterly indispensable in being saved in the end, and since fear has a key role in helping us maintain faith, therefore, note something. Literally, “look” at something. Look at what? Look at two things: the kindness of God and the severity of God. Or we could say: look at the mercy of God and the wrath of God. Look at the tenderness of God and the toughness of God. Look at the salvation of God and the judgment of God. Look at the assistance of God and the opposition of God. Look at the friendship of God and the fierceness of God. Don't look only at his gentler side. It will be bad for your faith. So that is the point of today's message: “Look—really look!—at the kindness and the severity of God.” Look at both . This is my answer today to the question: How do we maintain our faith? How do we fight the fight of faith? How do we keep on believing? Which also then answers, in part, the question, How do we defeat pride and anti-Semitism in our lives? First, let's consider what looking means, and then second, how God's kindness and severity work together to help us maintain our faith in Christ. 1. What Does “Looking” Mean? So where do you look to see the kindness and the severity of God? Of course there are two answers, because God has written two books. The book of nature and the book of Scripture. Psalm 19:1, “The heavens declare the glory of God, and the sky above proclaims his handiwork.” So you can see the glory of God's severity and his kindness as you look at his created world. But that book of nature is a very ambiguous book. Rarely do we know what we are looking at exactly. One event can look very much like severity and judgment (like the sudden violent death of mother), but in fact be a great kindness (because, unknown to anyone, she had a terrible disease that would have caused excruciating pain for months and then death). Or an event can look like a great kindness and blessing (like the windfall of winning the lottery), but in fact is severity and judgment (as lives are ruined by the love of money). Often one event is both—severity for one and kindness for another, depending on who is trusting God in it and who is angry at God in it. So the book of the world is filled with illustrations of the severity and kindness of God. But the illustrations are all ambiguous. They don't come with authoritative interpretations over them. They don't come with a tag: this is severity and judgment, this is kindness and blessing. This is why we must have the other book of God, the Bible. The Bible too tells the story of God's acts in the world, only there's a difference. The Bible gives God's own authoritative interpretations of what he is doing. He tells us whether something is severity and judgment or kindness and blessing. So the best answer to the question: Where do we look to see the kindness and severity of God? is: Look in the Bible. Read the Bible. He lived another 21 years after this and his biographer said that by the end he had read the Bible from end to end 200 times. This was the key to his persevering and powerful faith. He looked over and over and over day after day at the kindness and severity of God in the Bible. Your faith is shaped by what you look at. If you look at the kindness and severity of God the way they are woven together in the Bible, your faith will grow stronger and stronger. If you neglect the Bible, you will not see the severity of God and the kindness of God they way God means for them to be seen. You will not understand them. You will misinterpret them. And probably you will fault God and criticize God for his severity and take his kindness for granted and even feel deserving of them. If our faith is to last and be strong, we must look at the kindness and severity of God in the Bible. Again and again they are put beside each other lest we miss them. You cannot read far in the Bible without seeing both. A few examples. [ First, the severity ] And do not fear those who kill the body but cannot kill the soul. Rather fear him [God] who can destroy both soul and body in hell. 29 [ Then the kindness ] Are not two sparrows sold for a penny? And not one of them will fall to the ground apart from your Father. 30 But even the hairs of your head are all numbered. 31 Fear not, therefore; you are of more value than many sparrows. [ First, the kindness ] Do you presume on the riches of his kindness and forbearance and patience, not knowing that God's kindness is meant to lead you to repentance? [ Then the severity ] 5 But because of your hard and impenitent heart you are storing up wrath for yourself on the day of wrath when God's righteous judgment will be revealed. So Paul's answer to the question: How shall we maintain faith through the ups and downs of life? is “look at the kindness and severity of God.” Look at it. Read it. Put it before you mind every day. Both. Not just one or the other. 2. How Do God's Severity and Kindness Serve Faith? Now the final question I want to ask is, “How do God's kindness and severity work together to help us maintain our faith in Christ?” How do God's severity and kindness serve faith? First notice that severity and kindness don't serve faith in the same way. 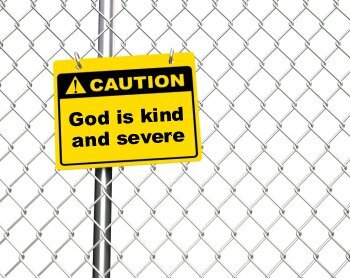 In Romans 11:22 Paul says, “Note then the kindness and the severity of God: severity toward those who have fallen, but God's kindness to you, provided you continue in his kindness .” It does not say, “provided you continue in his severity.” The aim of looking at severity is to keep you in kindness. Kindness is what we fly to. Severity is what we flee from. Severity is not a redemptive experience in this text. It is judgment and destruction. Sometimes we speak of a “severe mercy,” and there is indeed such a thing. Many of you have read Sheldon Vanauken's book by that title, A Severe Mercy . A wife's cancer and death is the salvation of a husband. But that is not what Paul has in mind here. Here severity means final judgment on unbelievers. That is what we are to look at, and fear, and flee from. So God's severity serves faith by sending us running into the arms of the kindness of God. Now does the fact that we are to continue in kindness not in severity mean that we are to continue in faith not fear? Verse 20 says, “They [the unbelieving Jewish people] were broken off because of their unbelief, but you stand fast through faith. So do not become proud, but stand in awe, [literally, “fear”].” You remain in the kindness of God by faith—by trusting in God's kindness. So what is the place of fear? I close with three answers to that question—three precious purposes of fear in the life of the believer which help us maintain faith and endure to the end. 1) The fear of God's severity should send us flying to God's kindness . When it does that, kindness casts out anxious fear. This is a rhythm in the Christian life. It's true that perfect love casts out fear (1 John 4:18 ). But none of us is perfected in love yet. Therefore, fear of God's judgment will continue to have a good effect in our lives and waken us again and again to think clearly about the preciousness of his kindness and drive us away from all false and deceptive hopes into the arms of God. 2) Fear deepens and makes serious the joy of our faith in God's kindness and helps to keep it from being trivial. It keeps faith from turning into mere morals or mere human relationships or mere doctrine or mere tradition or mere formalism. One breaking wave of the fear of hell over your soul will do the depth of your faith more good than many seminars on how to live for Jesus. God is not to be trifled with. And his severity is a gift to waken us from the slumbers of superficiality and triviality and game-playing. 3) Fear is a kind of sweetness in faith itself. It doesn't just send us flying to faith in God's kindness. And it doesn't just deepen the joy of our faith in God's kindness. It is in itself a kind of sweetness in our faith. I say this first because it's what the Bible says. For example, Nehemiah 1:11 : “O Lord, let your ear be attentive to the prayer of . . . your servants who delight to fear your name .” And Isaiah 11:3 says of the coming Servant of the Lord, “His delight shall be in the fear of the Lord .” I take this word “delight” to mean that there is a kind of sweetness to the very experience of fearing God, when the real prospect of hell and judgment and condemnation are removed. When the condemnation of God is removed from the dread of God, what's left is a humble, trembling, joyful awe and wonder. There's a reason why people run away from scenes of terror in real life, but still go to movies to see the same terror. There's a reason why no one wants to fall out of an airplane, but they will pay money at Valley Fair for the same sensation of falling. The reason is that we were created to be safely afraid of God. Everything else is an echo of this truth. We were made to be safely afraid of God, because when we are safely afraid of God—when there is no condemnation and we know that he is our Father and our Friend—then what remains in fear of God is deeply pleasant. Therefore, let us Look, Look! LOOK! At the kindness and the severity of God. Immerse yourself in the Bible. And may the severity of God send us flying into the arms of his kindness, may his severity deepen our faith in his kindness, and when all condemnation is gone by faith in Jesus, may his terrible severity become for us a trembling sweetness. A. T. Pierson, George Mueller , 287. By John Piper. ©Desiring God Ministries.